I've spent the past few months getting hands on with all the Hawke models we now stock and so the time has come to sit down and put each one under the spotlight for the full review. Available as 8x32, 8x42 and 10x42, the Hawke Endurance range retail from an affordable £149.95, a price from which you'd expect to receive a good quality pair of binoculars, so lets see how they get on. From the off I could see the Endurances were a steady, solid performer, especially given their modest price tag. Often with optics in this price range you may find they are great when the sun is shining, but when it comes to dusk or looking down in to the shadows of a thick shrub for a shy bird, the binoculars fails to impress. The Hawke Endurances certainly don't feature in this category, retaining a high level of contrast, detail and colour with, as I have come to expect from Hawke's binoculars, an impressive depth of field. This seems to give the image a bit more 'pop' making them very pleasing to use. Sharpness is decent, not outstanding, but perfectly good enough for everyday use, with the wide centre sweet spot being one of this pair of binoculars' strong points. For overall brightness, they performed well throughout the day with the 8x42s (with the best exit pupil) continuing on to perform the best as the light deteriorated. CA (chromatic abberation/ purple fringing) is handled very well for a non ED binocular, still noticable but only just. Close focus is quoted at 2m for all models, I found this about right for the 8x32 and 10x42s but could get closer to 1.5m with the 8x42s, each of which is ample close enough for insects and such. Out of the 3 models, the 8x42s also come out on top for field of view, boasting a huge 8.1° or 142m/1000m. 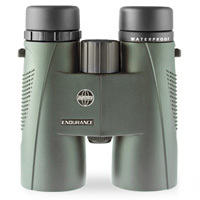 The 8x32s are quoted on Hawke's website as the same, though on the binoculars themselves the figure stated is 7.4°, a bit confusing to say the least. Comparing both the 8x32s and 8x42s, I found them not disimilar and when compared to Opticron Discovery 8x32s, quoted at 7.5°, I found the Endurance 8x32s produces a wider image, so I should think the figure on the website is more accurate. The 10x42s feature a 6.5° FOV. As with all Hawke Binoculars, the Endurances are made in China and feature a 10 year guarantee. All models are about average in size and weight and feel very ruggedly built. The twist up eye cups offer decent eye relief, are smooth to use yet hold nice and firm when set. The diopter, placed as with most binoculars, below the right eye cup, is a standard smooth turn and allows for easy initial adjustment. Having used and reviewed many of Opticron's binoculars, I am surprised by the variation in how fast/ slow the focus wheels turn, whereas with all of Hawke's models they are all about the same, allowing for fast focus from up close to infinity yet still easy for precise adjustments. Hawke informed me the Endurances are made from polycarbonate, covered in a rubber armour, hermetically sealed and nitrogen purged, making them 100% waterproof and fog proof. As with the more expensive Frontier EDs, the Endurances feature a textured grip on the side of the barrels, offering just that extra bit of reassurance when holding them, a nice touch by Hawke I think. They certainly feel well balanced, the 8x32s suiting my smaller than average hands nicely, but the 42mm models allowing that extra space for a slightly sturdier grip. Each model fit really nicely against me eyes and were very comfortable in use, though I often say binoculars are a very personal thing so may suit some more so than others. An all round good performer. The Endurance models all produce a very pleasing image in a well built, well gripped body that is comfortable to use with 1 or 2 hands alike. I personally believe they represent fantastic value for money and wouldn't hesitate to recommend them to those looking for a decent spec, good quality pair of binoculars at a more than affordable price. 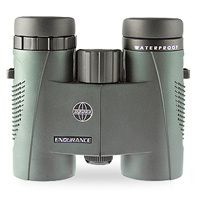 2015: Hawke Endurance PC models have been discontinued and replaced with Endurance ED binoculars.